In the early days of World War II, one of the most popular varieties of comic book superheroes were the patriotic ones that proudly flew the American flag. Before the United States even entered the war, comic book publishers were giving their readers characters ranging from The Shield and Captain Freedom to Uncle Sam himself. But perhaps the most lasting of these characters is none other than Captain America. The creation of Joe Simon and Jack Kirby, he made his first appearance in March 1941, knocking out Adolf Hitler on the cover of "Captain America Comics #1." He defended the United States against Nazi and Japanese troops during World War II, but his popularity waned once the war ended. He faded into obscurity, outside of a short-lived reappearance in 1953 to fight the red menace of Communism. Captain America remained in limbo until 1964, when Marvel Comics resurrected him to be a member of their superhero team "The Avengers." He's been around ever since, yet despite his long tenure in the comic world, he's never truly achieved the same kind of mainstream recognition as Batman or Superman. Then again, Captain America hasn't really seen much success in other non-comic forms of media anyway. Believe it or not, there was a time when movies based on Marvel properties were average at best (and horrendous at worst). But prior to movies like Blade, X-Men, and Spider-Man, Marvel was tied to less-than-stellar adaptations in the early '90s, and one of them was based on Captain America. It was intended for a theatrical release in America in 1990, but it was instead held back, seeing European releases before just shuffling the movie off straight to American video store shelves in 1992. Maybe the distributers realized just how awful this movie was and tried to keep people from seeing it for as long as possible. The movie opens in Italy circa 1937, where a young child prodigy named Tadzio de Santis (Massimillo Massimi) is held captive by Nazi soldiers and forced to watch them murder his family. The Nazis have developed a process to create super-soldiers, and their best choice is a psychologically fractured little boy that can play piano like a champ. I guess that makes sense to someone. One of the process's developers, Dr. Maria Vaselli (Carla Cassola) objects to using a young boy as their test subject, and flees to the United States. The expatriated Nazi scientist sells her super-soldier secrets to the Army, who have developed their own version of the process (named "Project Rebirth") after seven years of work. Project Rebirth's first lucky volunteer is Steve Rogers (Matt Salinger), a gangly all-American young man stricken with polio. The experiment is a success, but Dr. Vaselli is shot and killed immediately thereafter by a Nazi spy. Steve gets shot too, but he isn't gonna stand for that kind of crap, so he electrocutes the spy on some lab equipment. Two days pass, and the fully healed Steve has adopted the name "Captain America," donning a fireproof costume and wielding an indestructible shield that doubles as a weapon. He's dropped into a Nazi camp just in time to stop them from launching a missile pointed at an unknown target in the United States. He fights his way into the missile command center, where he is immediately confronted by The Red Skull (Scott Paulin), the now-adult subject of Dr. Vaselli's previous experiment with the Nazis. I have no idea why he would pledge loyalty to the Nazis after he watched them murder his family, but hey, I don't write the movies. I just review them. Getting back on track, Red Skull is a physical and intellectual equal to Captain America, only his face is incredibly deformed (thus earning him his name). The two fight, but Captain America finds himself incapacitated and strapped to the Nazi missile. The Red Skull reveals that the missile is pointed at the White House, so Captain America decides that if he's going down, he's taking the Red Skull with him. He grabs Red Skull by the arm just as the missile begins to take off, so what does the crimson-faced villain do? He doesn't pull his arm away, nor does he shoot Cap to make him let go. Instead, he chooses to cut off his own hand. Brilliant idea, Red. The missile is launched with Captain America still hitching a ride, but as it approaches its target destination of Washington, he manages to throw it off course and sends it flying into the Alaskan tundra. Man, that must have been one hell of a rocket if it made it all the way from Germany to Alaska. Anyway, Captain America ends up getting frozen in suspended animation, and he'll be staying there for quite a while. Our hero thaws out fifty years later, and a lot has changed since 1944. The Red Skull has gone back to living under his real name, had facial reconstructive surgery (for the most part, anyway), and controls a vast criminal empire responsible for murdering Martin Luther King and the Kennedy brothers. Already bummed due to a combination of some wicked culture shock and the belief that he failed his country, things don't get much better for ol' Steve Rogers when he discovers that his old girlfriend Bernice (Kim Gillingham) has gotten old and has a family of her own. But to his amazement, he sees the Bernice he knew in her lookalike daughter Sharon (also played by Kim Gillingham). These changes in the world leads him to put away his mask and shield and live life as a simple civilian. But once he learns that the Red Skull has kidnapped the President (Ronny Cox) and killed Bernice while he was at it, Steve must once again adopt his Captain America persona to save the day. Well... what do I say? Though it probably isn't as bad as its reputation lets on, it's still far from good. The movie does manage to have a very weird charm, but charm does not a good movie make. The directing is uninspired, the writing is lame, and the acting is stiff and wooden. I've heard that director Albert Pyun and screenwriter Stephen Tolkin have done interviews professing a total lack of interest in Captain America, and it shows. The movie's protagonist spends maybe twenty minutes of the movie actually wearing the Captain America costume, which is a total rip-off if you ask me. I can understand making a mediocre movie due to budget restraints or constant studio interference, but part of me believes that Pyun and Tolkin made a crappy movie just because they didn't respect the source material. And when your tale of a patriotic super-soldier that gets frozen before his triumphant return fifty years later is getting out-shined by direct-to-video obscurities like Matthew Blackheart: Monster Smasher, you're obviously not doing a very good job. And is it just me, or does that costume just look like a star-spangled body condom? People think the costumes in Joel Schumacher's two Batman movies were ugly, but the one worn by Captain America here has them beat. Don't get me started on the fake ears on the sides of the mask, either. Let's hit the cast really quick, shall we? The son of reclusive author J.D. Salinger, lead actor Matt Salinger has all the appeal of a dirty mop, showing none of the charm or determination that makes his comic book counterpart so engaging. Scott Paulin is also flat and unaffecting as Red Skull, even through pounds of latex makeup. I'd have forgiven him if he'd played Red Skull like a villain on the old Batman TV show, because that would have at least made it fun. But no, we don't get that. Kim Gillingham is forgettable, and both Ned Beatty (who has a small role as a reporter) and Ronny Cox are just there. I can't blame the cast, though. They need work just like any other actor, and if the director can't motivate them into a good performance, it isn't their fault. Like I've been saying, the only awards Pyun's direction would have won were a couple of Razzies, but then again, we're talking about a guy who has movies like Alien From L.A. and Kickboxer 4: The Aggressor on his résumé. Where the movie's real problems lie are in Tolkin's script. You can use words like "inane" or "banal" to describe the script, and you'd be totally right. I know it's probably not that big of a deal in the long run, but why change Red Skull from a German Nazi to an fascist Italian mob boss? It's not like it was an itty-bitty detail like the white Kingpin being played by a black man in Daredevil or the brunette Daisy Duke being played by a blonde in the Dukes of Hazzard movie. He's a Nazi terror in the comics, and that's what he should be in the movie. And Red Skull is given a pathetic childhood trauma origin story, when we really shouldn't be feeling sympathy for the evil monster. And the change in Red Skull's home country isn't the only stupid thing in the movie. Once Dr. Vaselli is killed, it is revealed that Captain America is one of a kind because she kept all the info on her super-soldier serum in her head. Couldn't they think of something a little more believable? They could have said the serum was dependant on a rare blood type or some rare gem/element, or there was a fire that destroyed all her notes, or something. But no, she didn't even bother writing it down. And then she goes and puts some important information like Red Skull's real name and the location of his hideout in her diary, of all places. Tolken may not have liked Captain America, but at least he could have tried to write a script that was, y'know, good. If it were me, I'd have set the whole movie during World War II, and had them frozen at the end to set up Captain America 2. But again, that's just me. 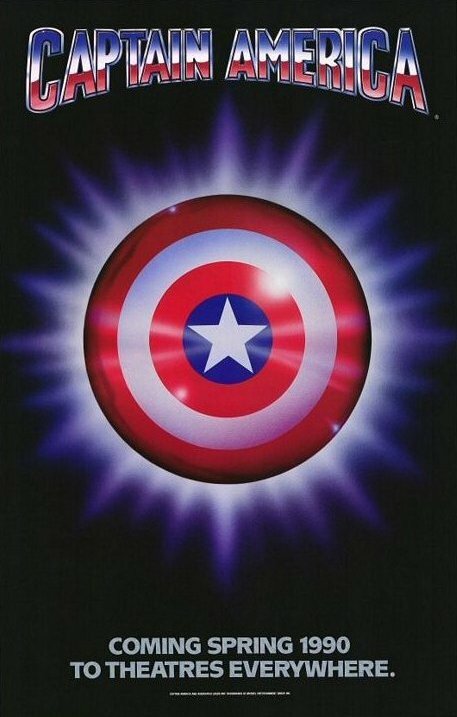 Those behind the movie's production really hit the nail on the thumb with their depiction of Captain America. I've definitely seen worse comic book adaptations, but I've definitely seen a lot more that were better. A newer version with a bigger budget (and hopefully, a good cast and a competent director and writer) is in the works at the time of this review, and hopefully it'll turn out a lot better than this steaming turd. Captain America wasn't totally awful, but it didn't make me want to watch it more than once. I'll give the movie one and a half stars, and you shouldn't feel bad if you miss it.